BMW Brilliance Automobile Ltd. owns BMW brand and ZINORO brand and BMW 3 (incl. standard wheelbase and long wheelbase), BMW 5 Series Li, the BMW 2 Series Tourer, the new BMW 1 Series Sedan, the BMW X1, All-New BMW X3 and ZINORO 60H. The all-new BMW X3 has 12 industry-leading features and 20 high-end configurations as standard, giving the entry-level X3 variant a premium touch. The all-new X3 is developed on the CLAR platform, its lightweight construction is consistent with overseas models, and the weight of Body-in-White is reduced by 55kg compared with previous generation. Combining the renowned and improved 2.0T engine with the 8-speed automatic transmission, the all-new BMW X3 has the best dynamic performance in segment. The new BMW 5 Series Li is developed and tested synchronously with the standard wheelbase version of the overseas market. It is tailor-made for the Chinese customers and is the most sporty business sedan that meets all your aspirations. The new 5 Series Li sets new benchmarks in China’s premium business sedan segment with competitive edges in dynamic styling, fascinating driving, top class well being and cutting-edge connectivity. The new BMW 1 Series Sedan is the most sporty compact sedan for young self-expression, tailor-made for Chinese young customers under BMW global platform. It sets benchmark in Chinese premium compact sedan segment with sporty design, best-in-class dynamic performance and cutting-edge connectivity. Boasting a large space capacity and equipped with advanced technology, an elegant appearance in gorgeous body colors make this car the typical dynamism and aesthetics design of a true BMW. The New BMW 2 Series Tourer can meet demands of modern family in the new generation: whether traveling for family or going for a ride in the most fashionable places around the city. 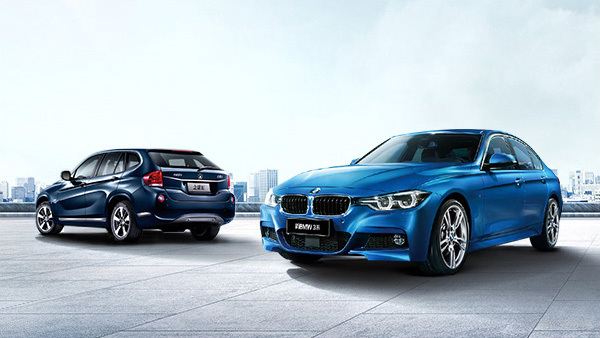 Characterized by strong sports DNA, the BMW 3 Series is known for its 40 years of sheer driving pleasure. New BMW 3 Series combines the dynamic design with unparalleled agility and excellent practicability, and always delivers the joy of dynamic driving pleasure in an irresistible glamour. Compact appearance, spacious and flexible interior. All-New BMW X1 offers the best sense of control no matter in urban diving or off-road. All engine codes for All-New BMW X1 follow the philosophy of BMW Efficient Dynamics, aiming to provide maximum power on road running as well as the minimum fuel consumption.